Thankfully, my situation is not nearly as bad as many people’s. Despite the fact that I have little money, I have a lot of privilege in a variety of ways when it comes to work and money. I’m essentially treated well at work, and my work is often interesting, and I do get benefits that many people still don’t, such as health insurance and some sick time. And sure, if I still had comments turned on, I would immediately get a bunch of condescending comments about how “well I have a very stressful busy job but I still manage to [do thing].” Okay, we’re all different. I think my chronic fatigue is a major factor in a lot of my difficulty with self-care, but again, there’s no way I can engage in treating it right now when I’ve already used up all two of my sick days on actually being sick! What’s the best self-care I could do, taking a bubble bath and collapsing into bed, or actually seeing a doctor and having tests done and trying treatments? Obviously the latter, but that’s inaccessible right now. Besides this list, I actually do quite a bit of self-care. In fact, since I have few responsibilities besides work (which I thankfully cannot and do not take home with me), I’m mostly free to engage in self-care between the hours of 5 PM and 11 PM daily, and all weekend. I do several self-care activities every day, usually reading, writing, watching TV, seeing friends and partners, taking walks, cleaning my house, eating yummy food, petting my cat (when she deigns to allow it), crafting, or otherwise doing something that feels restorative rather than obligatory. Yet it’s not enough, and I’m quite stressed (especially on Sunday nights and Monday mornings), and my health is kind of a mess right now because I don’t have the time and money to take care of it. Why is that? That’s where employers come in. When you don’t have enough money or time off work to do self-care, all the books and cats in the world aren’t going to get the job done. And that is especially true for all the folks out there whose work situations are considerably more stressful and unfair than mine, who have to work on-call, who get no paid time off at all, who can get fired just for staying home sick, who do have to take their work home with them, who don’t get health insurance, who are raising kids and supporting parents or partners, who are paid garbage salaries, who work six or seven days a week plus holidays, who haven’t taken a vacation in years or ever, who work nights, who work multiple jobs, who work in dehumanizing conditions rife with sexual harassment, racism, and other oppressions. Why are we even talking about self-care when people are working in such conditions? One is that we don’t think fair pay, benefits, and work conditions are even possible under capitalism, so we focus on surviving as well as we can. That’s fair. 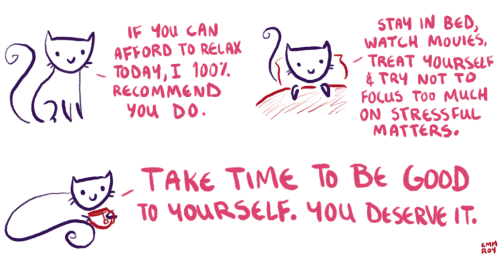 The other is that it’s more comforting to think of self-care as a completely individualized thing rather than as a part of a collective responsibility, just as many feminists would rather get bogged down in arguments about whether or not it’s feminist for individuals to do this or that than to discuss structural issues and how they inform and constrain individual choices. Regardless, I’m not interested in derailing conversations about self-care taking place between individuals with “BUT WHAT ABOUT EMPLOYERS THO.” But when the directive to “remember to practice self-care!” is coming from an employer, I’m less patient. In my view, employers have no business telling employees to do self-care until they provide them with just and sustainable work environments. I don’t want to hear about chocolate and bubble baths until I get enough time off work to see a damn doctor. Because in my experience, most people in healthy circumstances do not need constant reminders to practice self-care. Yes, there are some who get so caught up in work (including domestic work) that they don’t do self-care despite having the ability to. (If you know any programmers, or are one, you probably know what I’m talking about.) But most of the time, people are naturally motivated to do the things they love and that make them feel better. One exception to this is when someone has a mental illness, and in that case, the mental illness needs treatment in addition to the person doing self-care on their own. When employers themselves are constantly exhorting us to practice self-care, something’s already broken. And while it may very well be the case that good self-care can help us survive otherwise-intolerable situations, that doesn’t make it grate any less when the people with the power to make those situations more tolerable are the ones advocating self-care as the solution.